Look at the myriad of stars and constellations above you. Who set them to burning, each in its place? Who knows those countless lights each by name? because God has the great strength and strong power to make it so. Friends of mine have three little children. The oldest, Ethan, is six. He wants to be a pizza delivery man when he grows up and marry his childhood friend, Isabella. Four year old, Emma vacuums up spiders, dances in tiny ballet shoes and is one of the most beautiful little girls I know. Caleb is the type of guy who smiles in the direction of a girl, says “Hey!” and wins her heart. He is only two but I reckon he will still pull it off when he is seventeen. About a year ago a friend of theirs, a little two year old boy, passed away suddenly. It amazed me that the death of their friend did not diminish life for these three small children; it simply altered it for a time, until once again they could play with their friend. Their mom told me how while her kids understood that their friend could no longer come and play with them, they would still ask when he was coming to visit. Ethan, grasps their friend is in heaven, but could not understand why they could not visit him the way they could friends in Cape Town or London. For Caleb, Sophia and Joshua death is only a postponement of pleasure; it is eating the main course so you can have dessert; reading a book from the beginning without skipping to the end. To these under six’s, death is the anticipation of something good; like waiting to open a present till Christmas morning. I would like to view bereavement like these children: not as the termination of life with a friend but as an invitation to spend an eternity with them; infinity without death or separation. Shortly, after my brother heard his best friend had died in a cycling accident, he told me through tears, dripping like wet paint down his cheeks, that he now had a reason to look forward to heaven. Now, that is viewing death as a little child does, as an invitation to have a play date that has no end, a play date that has just begun for one of the friends. It is also the realisation that the one who set out first is probably having a better time in heaven then they ever had on earth. I struggle with the fact that death has to exist. Death is the one thing that makes me question God’s existence. I know it’s a part of life. I appreciate that life often follows death but that doesn’t make me understand all the hurt and pain that comes with it. I cry and I get angry. I remind myself that Jesus doesn’t like death either which is why he came to give us eternal life. I share stories about those I have loved who are now heavenly men and women. I laugh at the good times we shared. And I look at the stars. I lie on my back in the country and stare up at the cosmos which stretches farther then our strongest telescope can see. I look up at the stars God strung just to astonish us. 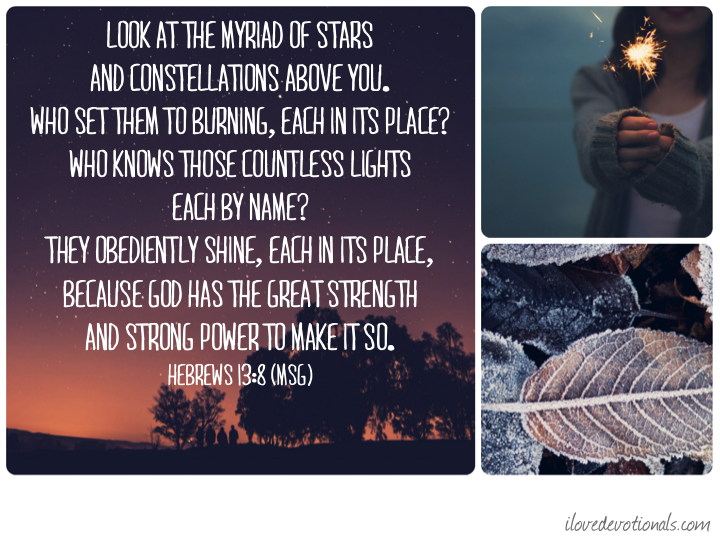 The stars he named to reveal his bigness, his majesty and his sovereignty. I look at the stars because they remind me of who God is. The stars tell me that God is not spiteful but awe-inspiring. 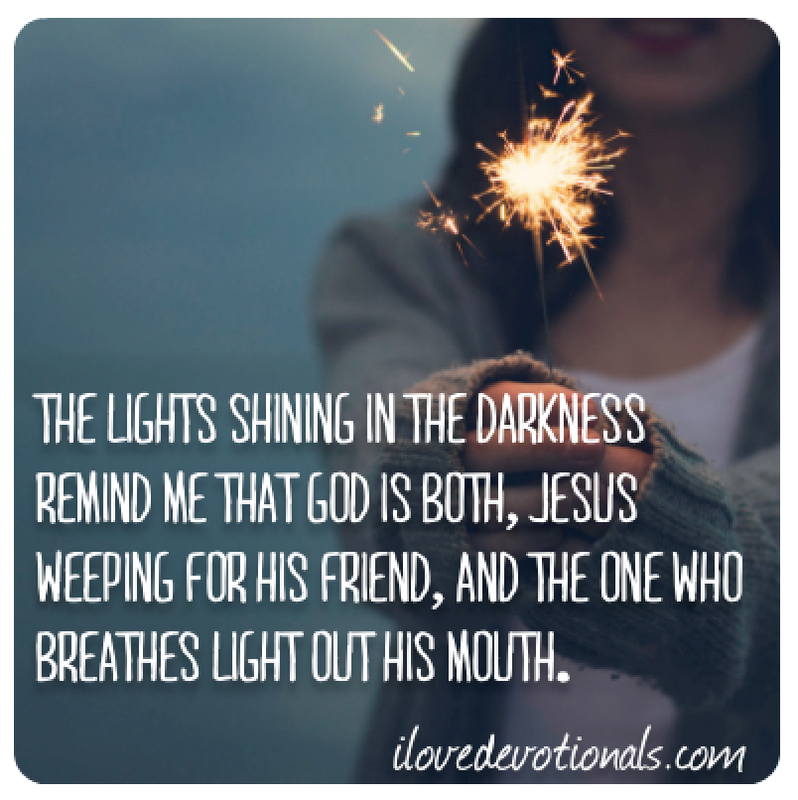 The lights shining in the darkness remind me that God is both, Jesus weeping for his friend, and the One who breathes light out his mouth. The stars expose how big God is and how tiny I am. As each star burns out, and shoots across the sky, I remember that in each death, there is beauty and mystery, if I choose to see it. Ponder: What helps you cope with death? Prayer: God, I don’t get death but I find comfort in the fact that you don’t like it either. Help me to see the new life being birthed out of pain in my life. Amen. Please share this devotional on twitter by clicking here. I’d also love for you to connect with me on my Facebook, pinterest and twitter pages or if you're viewing this via email you can leave a comment by clicking here.